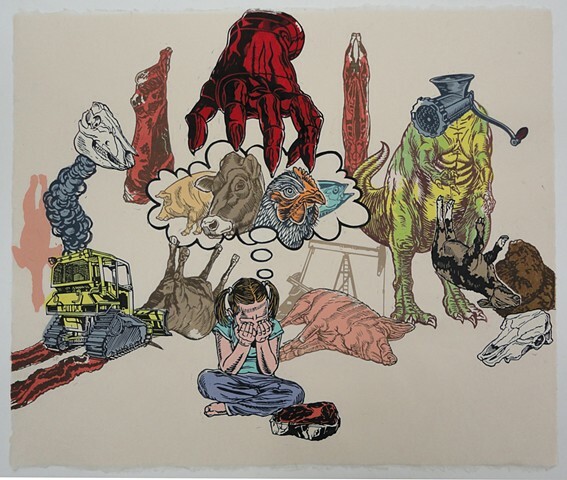 Pangs is a composite print made up of more than 50 individual linoleum blocks (the girl, skulls, smoke, tractor, etc. are each separate parts, assembled like a puzzle.) Working flexibly in this fashion enables me to make relatively simple changes to composition or color that can dramatically alter the narrative or meaning. The stylized imagery and saturated color palette deliberately make reference to the visual language of comic books and other forms of popular culture, with the intent of drawing viewers into a brightly realized, but grisly rendition of our food systems. The young girl in the foreground weeps as she realizes the horrible truth that lies behind her dinner. Its a scene repeated somewhere everyday. As children we have an innate affection for other animals, propagated by the suffusion of cartoon bunnies on our cereal boxes and stuffed bears in our cribs. This affection is inevitably disrupted as we learn that the animals we know as cows, pigs, and chickens - beloved characters in our bedtime stories - are being served to us under disguised terms: hamburger, hotdog, bacon, drumstick, meat.